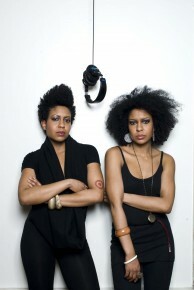 Twin sister dj duo Jacky Sommer & DatKat join Motion FM as of June 7, 2012. Tune in to Deep Motion FM stream every Thursday for live broadcasting of the best undeground sounds of New York or listen to the the Analogue Show on demand in our podcast section. Identical twin sister duo Jacquelyn & Kathryn Smith (aka Jacky Sommer & DatKat) got started in the arts at a very early age. Born in the SF Bay area to a writer mother and sculptor father, their childhood was marked by an avid appreciation and promotion of the arts and culture. At a young age Jacquelyn would soon discover her talent as a dancer while DatKat pursued the fine arts through painting and drawing. Music however, would prove to be the destined path for both of them. As 80’s kids, part of the first generation of MTV, the sister’s found themselves glued to the tube, mesmerized by the sounds of new wave and post punk, early hip hop, classic soul/r&b and pop, and they developed a keen interest in jazz, fostered by their father’s love of legends such as Chick Corea, Thelonius Monk, Dave Brubeck and Miles Davis, to name a few, while artists like Herbie Hancock, Paul Hardcastle and Kraftwerk would later influence their introduction to electronic music. Fast forward to LA in the late 90’s. By chance, the sisters would stumble upon an Eddie Amador residency. Unable to really put the experience into words, the girls would later characterize the night by stating “life just finally made sense at that moment.” This would mark the beginning of their passion and careers in dance music. They immediately acquired decks, began their record collections, and the rest, as they say, is history. An acceptance to the famed Alvin Ailey School in 2001 would see Jacquelyn off to New York and within a year, after shopping weekly at the legendary DanceTracks record store, she landed a job there, eventually becoming shop manager and music buyer, working amongst and even playing alongside some dance music luminaries such as Theo Parrish, Kenny Larkin, King Britt and Gilles Peterson. DatKat moved to NYC a year later and began quietly honing her skills. In 2004 the girls secured a weekly radio spot on the famed eastvillageradio.com and the Analog Soul show was born. The long-running show aired every Monday night from 10pm-12am and explored what they deemed “the deeper, darker side of techno and house”–but it also explored the full spectrum of electronic music, from minimal, acid, Detroit techno, electro, dub, dubstep, and d&b to trip hop and other forms, with special guests ranging from Function to Simbad, Roland Appel, Slam Mode, and Dj Qu. While the overall sound was largely dance-based, the show was aimed at promoting quality underground music and artists, and to expose some otherwise “genre-biased” listeners to a wider range of electronica. The show ended in 2009, and the twins would continue to play regularly at various venues in the city, such as APT, Love, and Stay. DatKat earned a residency at Montreal’s Academy Club and more international gigs would soon follow, with headlining stints in Kiev, Ukraine at Xlib Club and Sky Art Cafe and Moscow’s legendary Propaganda Club for Nina Kraviz’s “Voices” party. In early 2011, DatKat formed a collective called RADIO with close friend Lenny Posso (label boss of Thema Records) and A.Arias, a record collector and NYC promoter (Sound Noir and Helping Hands), and began throwing warehouse parties tailored to bringing the real underground back to NYC, booking the likes of Terrence Dixon, Oliver Ho, Christian Rau, Small People, and Trus’me among others. Jacquelyn continues to DJ regularly in NY and is currently a curator for Satelliterecords.com. In a short period of time the twins have made a name for themselves as tastemakers in the underground dance music scene.